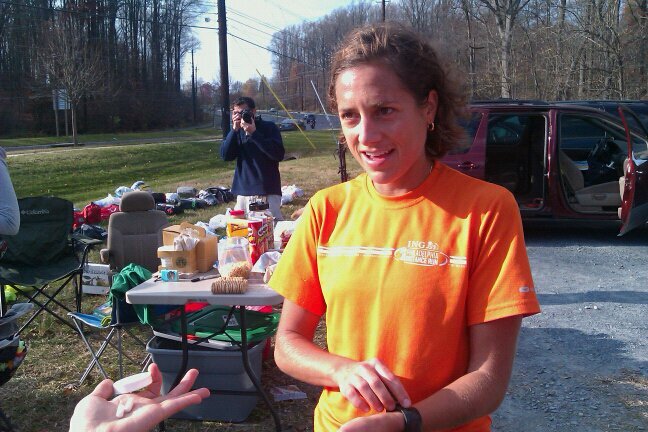 GEORGETOWN RUNNING CLUB: SHANNON FINISHES 50 MILER! REPORT: 9:35 for 50 miles over the undulating hill and dales of the Seneca Creek Trail. Shannon looking cool and collect at mile 40.
who is that peeping tom in the back? I definitely wasn't figuring those small mountains into my pace... Jarrin and Pilar, who arrived at every road crossing to cheer and offer roast beef sandwiches--thank you. Jake, for lifting my spirits and slogging some slow miles, thank you. And 'Bain,' what can I say? Through the toughest part (almost half the race..) you pushed me through. I could have never done it alone--thank you!! Wow - awesome job, Shannon! !